This weekend I finally got myself some very sought after tickets to the amazing Alexander McQueen exhibition - Savage Beauty - showcasing at The Victoria and Albert Museum in South Kensington, London and I was not to be disappointed! Obviously being a fashion event I wanted to dress a little more edgier but at the same time I was going straight from work so was slightly restricted as I still needed to look smart and professional. I decided to go for a shirt with tailored shorts to keep it smart but the shirt had a rather colourful pattern to show the edgier side. I also added a pop of colour with blue suede shoes! I honestly, hand on heart, can say this is one of the best exhibitions I've ever been to. I really felt it in my soul which I know sounds pretty deep but if you see the exhibition you'll know what I mean. The V&A have really gone to town to make this exhibition shine. It's quite dark, has a slightly spooky feel which I love. I also loved the quotes they have written on the walls to bring you closer to the man that was Lee Alexander McQueen. After the exhibition we wanted to go for some dinner and there was a lovely little square nearby catering all sorts of cuisines. 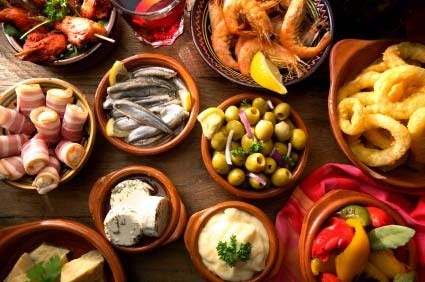 We decided to go for Spanish and spoiled ourselves with small tapas plates. I went for flatbread with fresh tomatoes and olive oil and of course my favourite, Spanish tortilla (omelette)! It was so yummy and as the weather was nice we even sat outside, alfresco style!